Description YELLOW BAND expansion joints suitable for petroleum based products with aromatic content up to 50%, fuels (ethanol content up to 85%), aviation fuels, town gas and natural gas except liquified petroleum gas. Temperature range (depending on medium) -20° C up to +90° C, temporarily up to +100° C. Electrically dissipative. Certificates Approvals: DNV · GL, Lloyd´s Register, Bureau Veritas, RINA Services S.p.A., American Bureau of Shipping, China Classification Society, Bundesamt für Wehrtechnik und Beschaffung, Deutscher Verein des Gas- und Wasserfachs. Description YELLOW STEEL expansion joints for petroleum based products, DIN EN fuels up to 50% aromatic content, cooling water with oily anticorrosion additives, lubrication and hydraulic oil, seawater. Temperature range (depending on medium) -20° C up to +90° C, temporarily up to +100° C. Fire resistant (to ISO 15540) up to 30 min. and +800° C. Electrically dissipative. Certificates Approvals: DNV · GL, Lloyd´s Register, Bureau Veritas, RINA Services S.p.A., American Bureau of Shipping, Nippon Kaiji Kyokai, China Classification Society, Marine Equipment Directive. Description YELLOW STEEL HNBR expansion joints for petroleum based products, DIN EN fuels up to 50% aromatic content, cooling water with oily anticorrosion additives, lubrication and hydraulic oil, seawater. Very good aging, weathering and ozone resistance. Temperature range (depending on medium) range -35° C up to +100° C, temporarily up to +120° C.
Fire resistant to ISO 15540 up 30 min. at +800° C. Electrically dissipative. Description ORANGE BAND expansion joints for Liquid Petroleum Gas (LPG) acc. to EN 589. For tank trucks and refuelling stations. Description GREEN BAND expansion joints for chemicals, acids, alkalis and aggressive chemical waste water. For oil-contaminated compressed air up to +90° C.
Temperature range (depending on medium) -20° C up to +100° C, temporarily up to +110° C. Electrically non-conductive. For media with more than 50% aromatics, Biodiesel etc. Description WHITE BAND expansion joints for foodstuffs, also containing oil and fat. Liner corresponds to Recommendation XXI of BfR and FDA-21CFR 177.2600. Temperature range (depending on medium) -20° C up to +90° C, temporarily up to +100° C. Electrically non-conductive. 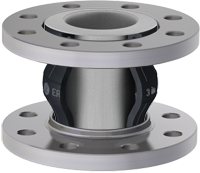 Description BR Expansion Joints, special type for abrasive media such as sludges, slurries, solid / liquid mixtures and emulsions, and dustlike or powdery products (e. g. carbon-blacks). Also suitable for all kinds of water (non oil containing ) as well as various chemicals. Not suitable for petroleum based products. For extreme strain (e. g. sharp and rough-edged matter) we suggest the use of ERV with inner protection sleeve type SR, see page 467. Temperature range (depending on medium) -50° C up to +70° C, temporarily up to +90° C. Electrically dissipative. Description ERV with PTFE-lining Used when the chemical resistance of the chosen ERV type is not sufficient. Suitable for all kinds of liquids in use. Electrically isolating, therefore not suitable for flammable liquids in Ex-Zones. Admissible working temperature of expansion joint has to be observed. For maximum pressure of 6 bar – not suitable for vacuum. RED BAND expansion joints for all types of water, drinking water, low concentrated acids and alkalis, salt solutions. 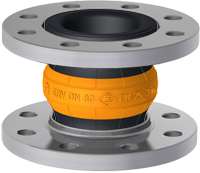 ROTEX expansion joints suitable for permanent use with hot heating water, cooling water and hot air. 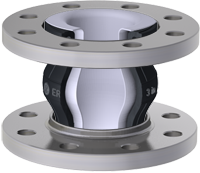 CR expansion joints for cold and warm water, also oil containing, grease and air, compressed air. Temperature range (depending on medium) -25° C up to +90° C, temporarily up to +100° C. Electrically non-conductive. RED SPOT expansion joints, highly flexible, for sanitary installations, pool water, sea water, drinking water. Temperature range -40° C up to +90° C, temporarily up to +120° C. Electrically dissipative. YELLOW BAND expansion joints for petroleum based products, fuels up to 50% aromatic content, town gas and natural gas. YELLOW STEEL expansion joints for petroleum based products, cooling water and sea water. Temperature range -20° C up to +90° C, temporarily up to +100° C. Fire resistant (to ISO 15540) up to 30 min. and +800° C. Electrically dissipative. YELLOW STEEL HNBR expansion joints for petroleum based products, cooling water and sea water. Temperature -35° C up to +100° C, temporarily up to +120° C. Fire resistant to ISO 15540 up 30 min. at +800° C. Electrically dissipative. YELLOW BAND LT, for low temperature applications for petroleum based products up to +60° C and gasoline up to +40° C.
ORANGE BAND expansion joints for Liquefied Petroleum Gas (LPG) to EN 589. 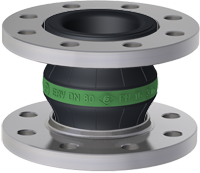 GREEN BAND expansion joints for chemicals and oil-contaminated compressed air up to +90° C. Temperature range (depending on medium) -20° C up to +100° C, temporarily up to +110° C.
VITEX expansion joints. Suitable for strain with aggressive media. WHITE BAND expansion joints for foodstuffs, also containing oil and fat. Temperature range (depending on medium) -20° C up to +90° C, temporarily up to 100° C. Electrically non-conductive. BR expansion joints, for abrasive media. Also suitable for all kinds of water (non oil containing) as well as various chemicals. Temperature range -50° C up to +70° C, temporarily up to +90° C. Electrically dissipative. ERV with PTFE-lining. Used when the chemical resistance of the chosen ERV type is not sufficient. Suitable for all kinds of liquids in use. Admissible working temperature of expansion joint has to be observed. For working pressure up to 6 bar. SR of stainless steel AISI 316 Ti to prevent abrasion of the rubber liner, i. e. for media containing abrasive components or to avoid cavitation. Description SR of stainless steel AISI 316 Ti to prevent abrasion of the rubber liner, i. e. for media containing abrasive components or to avoid cavitation. Please note: The nominal bore is reduced. Flame protection cover FSH for ERV, made of several layers of glass fiber fabric with a surface cover of silvercoloured high temperature resistant silicone-aluminium-glas fabric. (certified acc. MED A1 / 3.13 ). 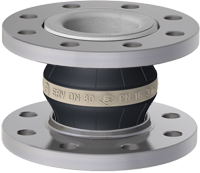 Description FSH for ERV rubber expansion joints, made of several layers of glass fiber fabric with a surface cover of silvercoloured high temperature resistant silicone-aluminium-glas fabric (certified acc. MED A1 / 3.13 ). Screws, nuts and washers of brass. It reliably protects the expansion joint against radiation heat and direct flames up to +800° C for 30 minutes. The flame protection cover is resistant against oil and chemical influences as well as against ageing and weathering. Because of its split design the flame protection cover can be mounted subsequently or re-opened. The dimensions have been chosen in such a way that also the counter flanges are completely covered. The allowed range of movement is not restricted.